A few months ago in late spring I was interviewed over the phone (I suppose that bit is important) by a journalist from The Weekly News. Excellent! It was a nice chat with Craig, I sent him some pictures and he proceeded to write the article and send it to the editor of his newspaper for publication. Nothing appeared in June or July and I began to wonder if my story had been jettisoned in favour of another. 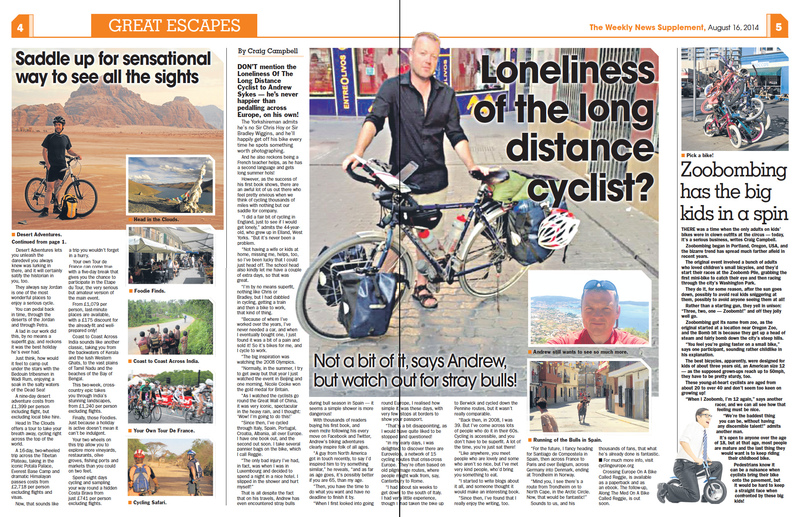 In August I headed off to Scotland for my short cycling tour and began to forget all about it… But a few days ago I remembered about the interview and emailed Craig; yes, it had appeared in mid-August. Brilliant! Today, he emailed across the page where the article had appeared and… oh dear. Who is that bloke next to Reggie? * It’s not me!